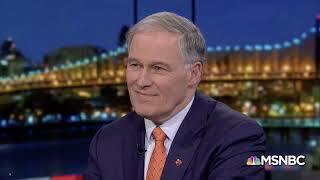 The Washington state governor*, Jay Inslee was interviewed yesterday on the Rachel Maddow Show. He is running for President on the single issue--Climate Change. Rachel gives a little background on his time in the U.S. Congress and then starts the actual interview at minute 06:30. I like this statement from his webpage. We are the first generation to feel the sting of climate change, and we are the last generation that can do something about it. The science is clear – we have a short period of time to act. Whether we shrink from this challenge, or rise to it, is the biggest question we face. Not trying to start a "political" conversation, just one about the need to respond to our global crisis. We need all the focused attention we can get on this issue that affects our quality of life and the survival of many of the species on the planet. Edit: Note. We are not re-engaging in the arguments about whether humankind activity-influenced Global Climate Change is a real thing or not. Please continue that discussion and debate over here in this thread. This is for tracking Inslee's bid for the nomination and bringing attention to the climate problems we are facing now and down the road. Thank you. *Edit 2: Apparently some folks are offended by calling him "our" governor. He is our governor, so we Washingtonians have a nuanced view of Inslee bred of familiarity. But for the rest of the country he is Al Gore 2.0. Square-jawed and handsome, rather stiff on a podium, and focused on climate change. I have difficulty seeing him make it past a national field due to a lack of charisma while speaking. If you have seen both him and Kamala Harris speaking extemporaneously, you know what I mean. He's nothing special as far as I see. I do not like hearing him take credit for our green power. That was started before he was born. We happen to have a lot of hydropower and I don't think he had anything to do with that. The windfarms are a novelty when compared with what the dams put out. I think he should stick to being a governor. He has zero chance of being nominated. Another funny guy is Howard Schultz...he is widely loathed in his own state. Ok, no more politics, lol. Can you give me examples in your life of the "sting"? Um, I didn't actually "write" that statement, I was quoting his statement from his webpage and his interview. I understand what he is saying (I believe), but I am not going to get into an argument with you about this. Your question has a confrontational edge to it. I'll take that answer as "none". Jay Inslee makes Cardi B sound like Winston Churchill. He is the only candidate campaigning on the most important issue facing the country and the world. For that reason alone his campaign is worthwhile, win, lose, or tie. I watched the gubernatorial debates; I'd say it's more than a charisma issue. See MyFootHurts's post above. Thunderhead: interesting chart. Seems like we got the lightning threat sorted, eh? Wonder if that's due to the decrease in the # of family farms since WW2 and inc in hazard education on golf courses? Weird that lightning deaths were the only ones reliably tallied for stats until 1940. I don't know much about Politics (not sure I really want too)....it seems that even Democrats on another forum who also live in this state don't care for Inslee, anyone care to tell me why in a Politically Correct Fashion?